October has been all about embracing the magic of autumn and waving hello winter! If you’re stuck on what to craft in time for the festive season, or if you’re just in need of a crafty catch up, then you’ve come to the right place! 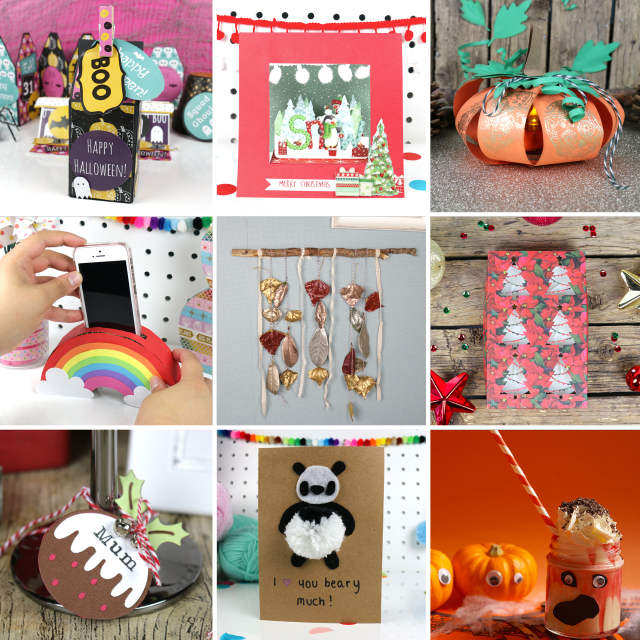 We have picked our top nine crafty tutorials to give you some inspiration, and you might just find a few surprises - in the form of fab free downloads and templates – ready for you to use! As Halloween is celebrated in October, we decided to give our papers a spooky spin! Download our designs to find pages adorned with colourful skulls, bats and ghosts, along with handy Halloween-themed toppers. In keeping with the Halloween theme, Angela helped us to create a calming ambience with this beautiful pumpkin tea light holder. Not just for Halloween this pumpkin will make you feel all autumnal during the dark nights. Complete with crispy ‘brains’ and raspberry ‘blood’, Elle Townsend took you step by step to create these delicious (yet spooky) milkshakes just in time for Halloween. Kathy showed us how to get into the festive spirit with your gift making by taking you through the steps to create a tea light gift box with the First Edition The Gift of Christmas papers. Platform card shapes have been super popular with the online crafting community, so we were eager to try out this great design using the Wonderland, the cute Christmas collection designed by Helz Cuppleditch. Maxine’s step by step tutorial showed how easy it is to create this 3D look! As the nights start drawing in, we brought you a tutorial to brighten up your day. This adorable rainbow phone holder is guaranteed to bring a smile to your face and is the perfect solution to misplacing your phone around your home! We welcomed autumn into our homes with this beautiful leaf garland, easily created with a few fallen leaves and the stunning WOW Embossing powders collection by following our step by step tutorial! Pom poms have been a serious trend recently, so Angel showed you how to make three different pom pom projects in her video tutorial. We couldn’t ‘bear’ for you to miss this! Maxine showed us how to have a Merry Little Dovecraft Christmas by showing us 3 ways with the super festive Dovecraft Christmas Pudding die! Which was your favourite tutorial from October? We’d love to see your inspired crafts so don’t forget to #trimcraft when uploading to social media and to share your makes in the Inspiration area. Hi I have made some of these great projects they are all super but the one I like the most is the pumpkin 🎃 fantastic. Keep up the superb projects coming great inspiration.x Irene.